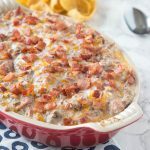 Bacon Cheeseburger Dip - all the flavor of your favorite bacon cheeseburger in an ooey, gooey, cheesy, dip. Great for game day, entertaining or just because! In a skillet brown ground beef, breaking apart and cooking until cooked through. In a large bowl add cream cheese, sour cream, cheddar cheese, diced tomatoes, cooked ground beef and the bacon. Mix until well combined. Pour into a baking dish. Bake for 20-25 minutes until bubbly and hot. Serve hot with corn chips for dipping.